May 2014 is the last month that I will have two incomes – my paycheck from my day job and my online income. Next month I will be down to just one income and it will be a challenge to adapt but I am looking forward to the opportunities that having only one income provides. My last month on my day job was a whirlwind of activity. The project I was working on required literally 110% of my time and energy. Even though I know I would be leaving my job at the end of May I did not let that interfere with me giving my all at work. I still kept to my morning ritual of working on my online business before work. At the end of the day I would come home work literally exhausted. Even so I still dedicated at least one hour almost every work week day to my online business. Once change I made was to turn off all my alarm clocks so they would not ring on weekends during May. I slept as late as my body wanted on weekends. Once I got up I spent most of my waking hours on the computer working on my online business. I was learning new skills and techniques in May and I wanted to get very good at them before I was down to one income. I started my job at Aaron’s on May 29, 2012. I left my job on May 30, 2014. I worked exactly 2 years and one day for Aaron’s. As I mentioned above my last month was the most exhausting month that I ever worked. My last week I had quite a few people that I worked with take me out to lunch and dinner. Between 10 lunches and dinners that week I had people take me out for 10 of them. Needless to say I was very grateful that people were willing to do that in appreciation for my work. 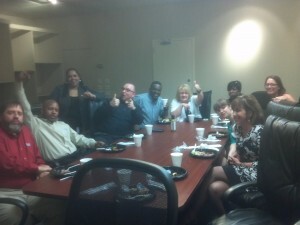 The biggest surprise was on Thursday lunch when the ladies in the department said they wanted to take me out to lunch. Around noon they came into my office and said we needed to get Bermicia who was in one of the conference rooms downstairs before leaving for lunch. When I walked into the conference room I notice a buffet for a catered lunch was setup in the rear of the room. As I walked around the corner the entire Training Department for Aaron’s was there. Surprise! 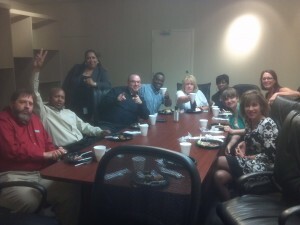 They gave me a surprise lunch for the whole department as a going away present. Here are pictures of the most amazing group of employees that consist of Aaron’s Training Department With only 10 employees we have created 155 training courses, conducted bootcamps for average of 30 General Managers every other week during the year and for 18 months we were training 60 live courses each and every week that were attended by 6,000+ employees. Now we converted all of our live courses to self paced courses and we average around 2,100 training courses completed DAILY! Aaron’s Training Department only has 10 employees. We accomplished all of that with just 10 people. No matter how people choose to try and re-write history NOBODY will be able to change the fact that these 10 employees accomplished more than any training department that is 3x larger. 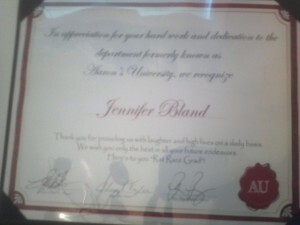 The department gave me a diploma as a present. Nothing could be more appropriate as a present than to get a diploma for somebody that was graduating from the ratrace. I cherish this present and it is sitting on my computer desk where i can see it every day. Here is my diploma. What an amazing present, what an amazing surprise to have the lunch and what an opportunity it was to work with these people. I will miss them all. Now let me share how my last month of having two income reports turned out. There is nothing that provides you with more credibility than being able to tell people that you are a published author. It gives you immediate respect. Regardless of what area you are interested in you should definitely write a book on the subject. It does not have to be a book as long as War and Peace. It could be as short as 100 pages. My longest book – Developing e-Business Applications Using Lotus Domino on the AS/400 – is almost 500 pages long. My shortest book is only about 45 pages long. Regardless of the length of the book as long as it provides valuable content then people will buy it. So put pen to paper and write your own book or books. In May I earned $59.43 from book royalties. In April I applied the video editing skills I learned from working in the Aaron’s Training Department to do some work for a friend for a project. My friend came back to have one final video done for him last month. It took me just a couple of hours of work to complete the video editing. With a payment of $150 it turned out I was earning $75 per hour for the work. That is exactly 3x more than I was earning working for Aaron’s. In May I earned $150.00 for video editing. As I have learned the hard way you should not depend on others as a method of earning money. 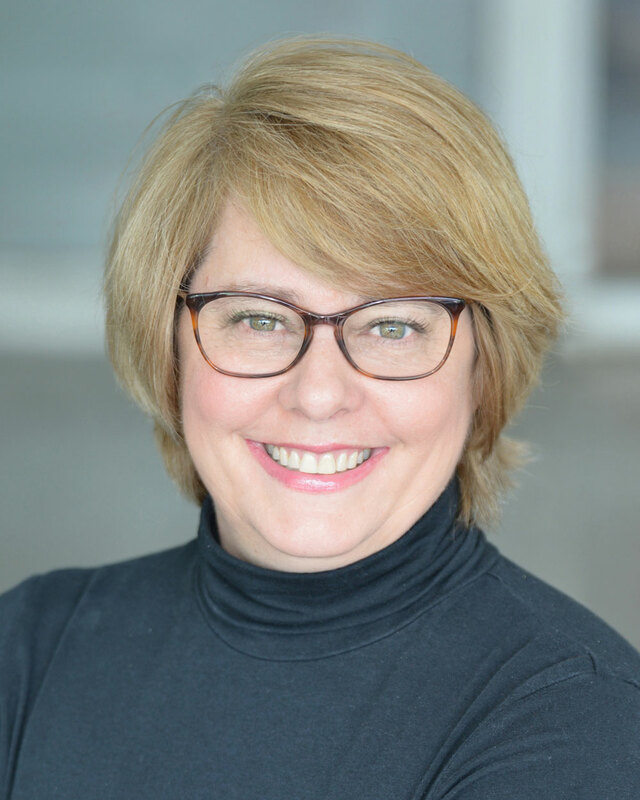 Though most people start with making money online with affiliate marketing, you are subject to the whims of that other person. Having your own products allows you to have complete control. Complete control over how much you make with your product. Complete control over who can promote your product. Complete control over how much you earn from the product. In May I earned $510.00 from the sales of my own products. Last month I made a slight change to my solo ads business. I have been busy combining what I have learned about Facebook Ads with list building. As a result I was able to almost double my income from solo ads from April. I have been playing with using Offers in Facebook Ads to drive people to a LeadPages optin-page. I have to admit my jaw has dropped at the conversion rate I am getting with LeadPages. It is incredible. My previous squeeze pages converted between 40%-50%. With what I have been able to create with LeadPages I am getting almost double that conversion rate. I am spending less than $100 to get several hundred leads from Offers on Facebook. Once they optin the Thank You page is presenting them with an offer for a product that I have an affiliate agreement with. People are purchasing the product which results in me earning a commission. Plus I now have these people on my own email list that I can market to for other products. Since I am earning commissions from adding a new subscriber to my email list I am including that income with my Solo Ads income. In May I earned $436.00 from Solo Ads. Adsense is one of those income streams that takes zero effort on my part to earn. I am sure I could do more to promote my sites that have adsense but I just don’t. I currently only have adsense on my iHvacZone and Invest in Real Estate niche websites. For some reason my income from adsense reached the highest point ever in May. It was almost 4x more than what I earned in April. In May I earned $19.60 from Adsense. I have been combining Facebook Ads with Affiliate Marketing in May. When I started I absolutely sucked at it. I ended up losing several hundreds of dollars in promoting affiliate product with absolutely zero sales. I kept at it and eventually I started making sales. I just kept tweaking what I was doing and ended up with some great results by the end of the month. My most existing result was just placing out of the money for a JV Affiliate launch contest. If you are not familiar with that let me explain. When somebody creates a new product they will get affiliates to promote it for them. To encourage people to promote they have an affiliate contest. Besides earning commissions from each sale they create, the affiliates that sell the most in the contest win cash and/or prizes. For example in Donald Wilson’s Facebook Ads Cracked 2 course, the affiliate who sold the most earned $50,000! Now most affiliate contests don’t pay out at that level. Most pay the top selling affiliate anywhere from $100 to $500. Just as I was starting to have success with Facebook Ads to LeadPages landing page and then promoting something on an offer page, I got an email from a friend that was sending out updates for the Leaderboard for his one week JV Affiliate Contest. There were 2 days left in the 7 day contest and he was paying out cash to the top 10 selling affiliates. I decided to apply what I was learning and started running ads with his product on the Thank You page. As a result in those 2 days I actually finished in 13th place. I finished outside of the money but I still earned commissions from all the sales I did create. From building my list using Offers and Facebook Ads I am sending emails to my list with details on other products I am promoting. I am starting to see lots of sales just from sending out an email to my list. As a result my income from affiliate marketing alone in May was creating than my entire online income for 8 out of 12 months from last year. Clearly this was a big improvement for me. In May I earned $3,031.90 from Affiliate Marketing. I have spent most of my time playing with Facebook Ads in May. The reason is there is such a wide range of potential for making money with Facebook. Yes I have had quite a bit of disappointment with some Ads generating no income. I looked back and saw that I spent over $700 on Facebook Ads in May that resulted in $0.00 in income. That is pretty tough to stomach that I am spending money but getting nothing in return. Actually it was a moment of panic as I realized that I MUST make this work because I was about to quit my day job and I needed it to work so I could put food on the table. Even after losing money on failed ads I still earned $1,891.16 from Facebook Ads. May was my last month of earning two income. Next month I will not be getting my $3,000+/month from my paycheck. Even so May turned out to be an incredibly successful month for me. This was the first month in which I broke $6,000 with my online income. Even with all the time I put into my last month on my day job I still stayed focus and kept working on my online income. At the end of May I was beyond exhausted. I ended up taking the last weekend in May and first two days of June off and did almost no work online. Instead I drove down after work on my last day on my day job to my older sister’s house. Her computer was running Windows XP which Microsoft just dropped support for. So I purchased a new computer from Dell and I delivered it to her and got it installed. Then we transferred all of her files to her new computer. I didn’t even open up my computer once during this time. It was nice to spend time with family before coming back and start working for myself. 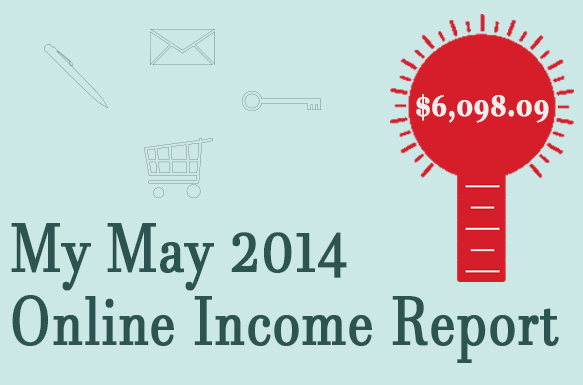 Here are the results of my May 2014 Online Income Report. Congrats on being able to quit your job. That is amazing. Great post keep up the good work and please continue to share your success. I have a question for you. How is it possible to sell Solo ads in the beginning (on facebook groups) without having any proof or testimonials? Thanks for reading. You start off by offering people a discount on the price of your solo ad in exchange for a reference. It is a win-win scenario. Once you get references then you start building from there. Good to see that things work out well for you. Is it possible to also list your expenses to see how much it costs to get thee good results? You are the second person to ask about expenses. I will consider doing it in the future. Congrats on a great month and the prospect of finally becoming your own boss! I am sure that once you can dedicate all of your energy towards making money online, you will easily break the five figures. You’re doing really great anyway, so keep up the great work and good luck! You better be right on your prediction! I am looking forward to getting to my first five figure month. Thanks for being with me along my journey and being a loyal reader. Thank you. Excellent work! I love seeing you achieve your goal and sharing your lessons from the journey. Keep up the great work. I see great things ahead for you. Thanks so very much. I believe you are right that there are great things ahead. Congrats on another great month and for finally being able to work for yourself. I’m trying to do the same myself (that’s the basis for my own blog), but it’s taking me awhile because I need to put more time into it. Nonetheless, your reports are inspiring. Keep working on building up your blog and never make excuses for not posting and eventually you will see the results. When I started I was strictly using Squidoo, Wordpress.com, Weebly, YouTube and other web 2.0 sties to promote a product. I chose products that did not have a defined launch window meaning they would close down after a set date. I’m really pleased to see that things are working out well for you. That’s a pretty impressive month there – and it’s also reassuring to see how “diversified” your income streams are. The *first* time I quit the rat race most of my income was based around a single website – which tanked a few months after “quitting”. While I enjoyed my long summer seeing friends, sleeping in and working hard on my online ventures I ended up having to admit defeat, headed back to my old employer and spent quite some months back in a job I disliked while I rebuilt my online revenue streams. Congrats on getting out of the ratrace but bummer that you had to go back in. Hope you get out and stay out next time. Really nice to see you make the dive and start doing what you want for your own future. Keep the momentum and also being an inspiration. Yes it has been a long time to get to this point and it feels great to be in control of your own future. Good job! I wonder how much of those 6k is profit. Would be interested to add expenses to your income report that way you can keep track of what’s going on. It seems I have gotten this request several times over the past couple of months to include expenses. Strange because it was never asked for the first 18 months I posted my income report. I can tell you that the net profit is more than my income from my day job which is what allowed me to quit my day job. I will consider adding expenses in the future. I stumbled upon your blog a few days ago and spent the last two days reading as many as of your posts as I possibly could. You are so inspiring and I love your writing. Kudos on getting out of the rat race. Please update soon, we want to know how it feels being your own boss now and of course how the month of June went for you. Best of luck! P.S. I am also a Californian, where do you reside in California, if you don’t mind me asking? I use to live in California when I worked for Apple computer back in 1989-1992. I am back home in Georgia now. Good jop! I am still reading your income reports since you decided to quit from the work before. I will, God willing, read the next income report for the next month waiting to find how is the benefit of quitting the work and work at home only. that’s because I want to do so. I just have my income report up from my first month of being my own boss posted this week. I can tell you that it will be just over $8k. Very pleased with my first month on my own. Thank you so much for the encouragement that you have offered us today this really shows that is possible for any one to leave the 9 to 5 job and get on with what ever they are going to be doing online only if they are are ready to put in some time in what they are doing. If you do not mind can you please share with us what was you monthly come at your former full time jobs that you have just left we will be looking forward to hearing that from you as it will encourage us. I took home right at $3,400 per month from my previous day job.